The Gravity Index from Denver, Colorado formed after the demise of Dav and Nick’s previous band The Facet in October 2000. Nate joined them on bass, Brian joined them on drums and Kurt joined them on guitar. 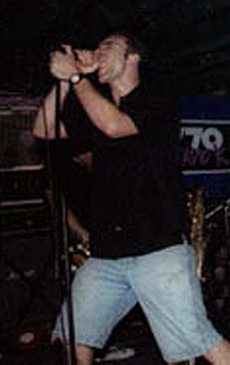 Nate played in another band with Nick called Still Left Standing. Kurt had also played in The Facet years before they before they broke up. The Gravity Index started playing shows in the Spring of 2001. During the Summer of 2001, they did a west coast and midwest tour. During this tour they had a 4 song demo cd-r for sale. In November of 2001, they entered the studio to record with Matt Vanleuven at 8 Houses Down. The six songs recorded became their self-titled CDEP that was released on Modern Radio in February 2002. The Gravity Index did a two west coast tours and midwest tour that Spring/Summer in support of the record. The Gravity Index broke up in October of 2002. Nick went on to sing for a band called Pariah Caste and Mustangs and Madras. He also plays sax and sings backups in Call Sign Cobra. Dav now lives in Seattle and is playing in a band called Countdown To Armaggedon. Brian played in Ghost Buffalo for awhile. Brian also did a zine called the Yellow Rake and published a book of content from the zine.